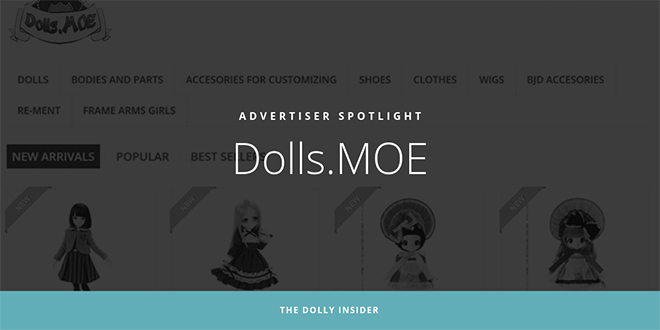 The Dolly Insider would like to shine a spotlight on our newest advertising partner, Dolls.MOE. Dolls.MOE is an online store own by Alex Ruiz. The shop offers a variety of dolls & accessories for collectors located in Europe. Dolls.moe started back in 2008 when I decided to make my hobby also a side business, with my mother helping out in the packing, so we are a family store. We started carrying exclusively Pullips and Obitsu / Pure Neemo bodies mainly through friends and Spanish conventions. Soon after we opened an online store to better manage the orders, and added other types of dolls which we were collecting, such as Azone and Blythe. We added Momoko, Ruruko, Dollfie Dream and Licca 4 years ago after traveling to Japan and being able to visit their amazing stores. Being in a country which has many talented customizers we received several emails demanding for supplies so we added MSC , bodies in all of their sizes, and Thinner into the mix. Don't hesitate to email or write on Facebook if you have any questions or special requests. If you need a layaway we will offer 3 months plan and 6 months for Dollfie Dreams. Did we mention you don't pay customs if you are in the EU? I bought my first Dollfie Dream here. And i had a lots of questions, which all were answered. Use code DOLLYINSIDER to take 3% off your order. Don’t hesitate to reach out to Alex/Dolls.MOE for any questions you may have. Follow Dolls.MOE on Facebook or Twitter for their latest product news. Je suis ravie que cette boutique existe en Europe, car j’habite en France et j’ai déjà passé commande de Lil fairy ! We’re glad to hear you enjoyed the article. Do come back and share. We’d love to Say Hi!